Home Tags Articles tagged with "crash"
First responders transported an 18-year-old passenger and 16-year-old motorist to the hospital Wednesday afternoon following a collision on the State Route 347 and Edison Road intersection. The accident involved a midsized SUV and a passenger vehicle around 2:19 p.m., said Maricopa Fire/Medical Department spokesman Brad Pitassi. Emergency crews evaluated the 18-year-old female passenger of the SUV for a non-life-threatening head injury, Pitassi said. The woman was reportedly not wearing her seatbelt during the accident, causing her head to hit the vehicle’s windshield, Pitassi said. The woman was later transported to the hospital. Three others inside the SUV were wearing seatbelts. The other car, Pitassi said, was a passenger-vehicle driven by a 16-year-old female motorist. “She was wearing her seat belt, and her parents have asked her to be transported to the hospital for further evaluation,” Pitassi said. Police temporarily restricted traffic in the area. Pitassi said crews are working to reopen the intersection. Maricopa Police Department is investigating the cause of the accident. Updates to this developing story will be posted to InMaricopa.com. 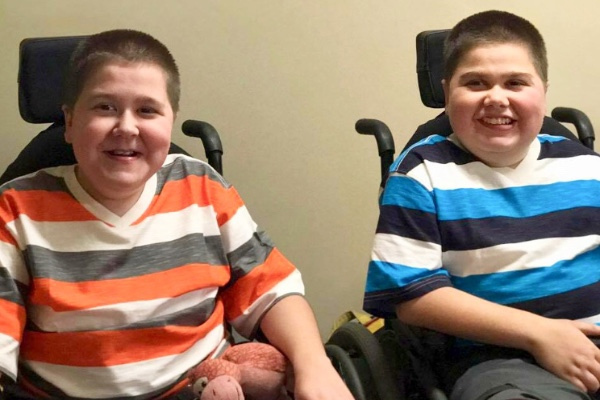 A 17-year-old boy in a wheelchair died at the hospital Sunday after being ejected from a vehicle in a two-car collision in Thunderbird Farms, a spokeswoman for the Pinal County Sheriff’s Office said. The fatal accident occurred at approximately 2:29 p.m. on Oct. 29 at the intersection of Ralston and Papago Roads in unincorporated Maricopa. 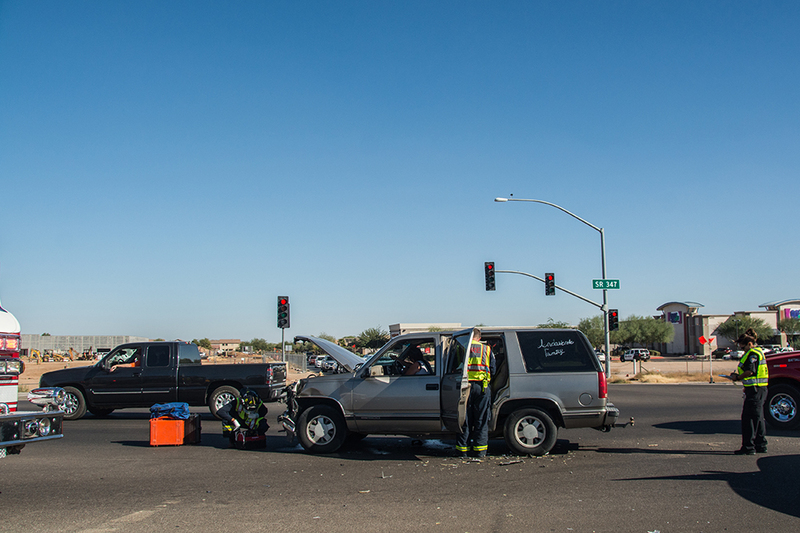 Prior to the collision, a gray minivan carrying at least five passengers was westbound on Papago Road. Pinal County Sheriff’s Office spokesperson Navideh Forghani said a driver of a 2018 black Acura driving north on Ralston failed to stop at the intersection’s stop sign and continued north through the roadway. 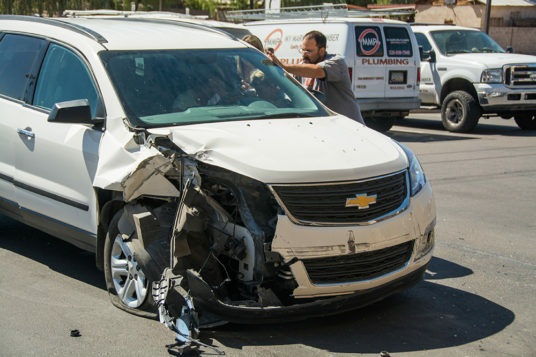 The driver of the minivan struck the rear passenger-side of the Acura, causing the van to spin into the northwest corner of the intersection and roll onto its side, Forghani said. 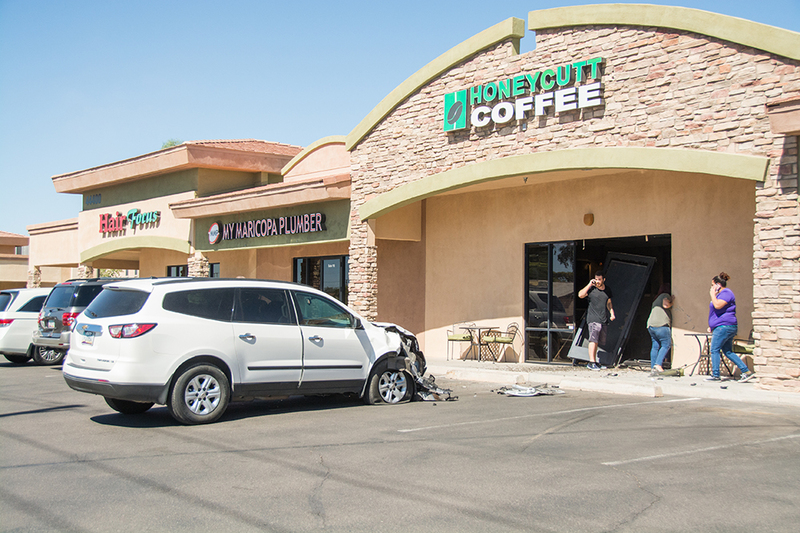 A 1-year-old and a 39-year-old in the rear seat of the minivan were both uninjured. Another person in the van, described by PCSO as a juvenile, suffered a broken arm. Charges are pending against the driver of the Acura. PCSO said that driver’s condition is unknown. Residents nearby reported hearing sirens, seeing a medivac helicopter and multiple emergency responders at the scene Sunday afternoon. The minivan’s “entire left side (was) ripped off,” said Amy Rogers-Boterman who lives in a neighborhood not far from the intersection. PCSO has not released the victim’s name. 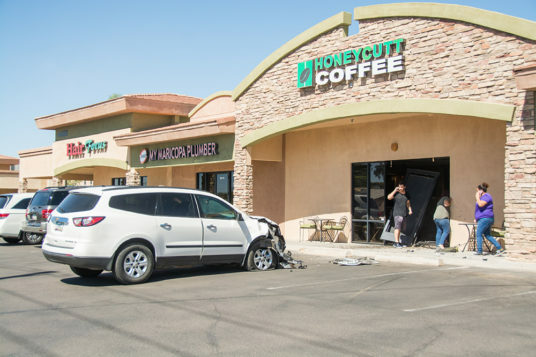 At least four people have been transported to the hospital after a minivan crashed through the front doors of Honeycutt Coffee Monday morning. Police described the driver as a woman in her 40s or early 50s. Also inside the vehicle at the time of the crash was a female passenger in her 70s. “The driver went to put the car into park, and according to her, the gas pedal went to the floor and the vehicle went through the building,” said Maricopa Police Department spokesman Ricardo Alvarado. Police said both women were transported to Chandler Regional Hospital for possible injuries. Police are investigating whether impairment is a factor. 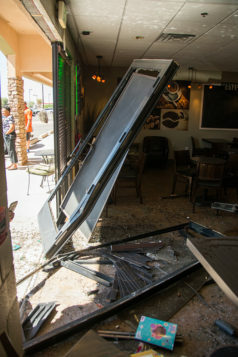 Around 11: 30 a.m., witnesses nearby said they heard a crash and found glass, tables and chairs strewn across the ground. 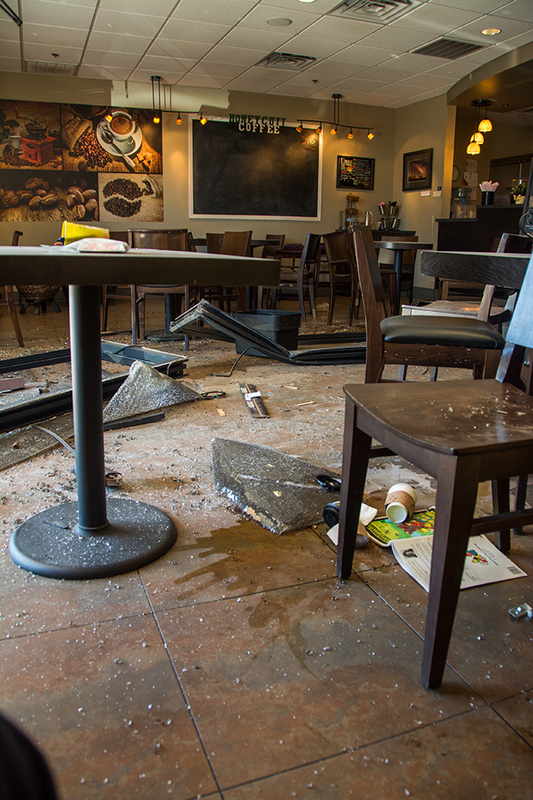 Six people were inside the building at the time, including four patrons and two employees. 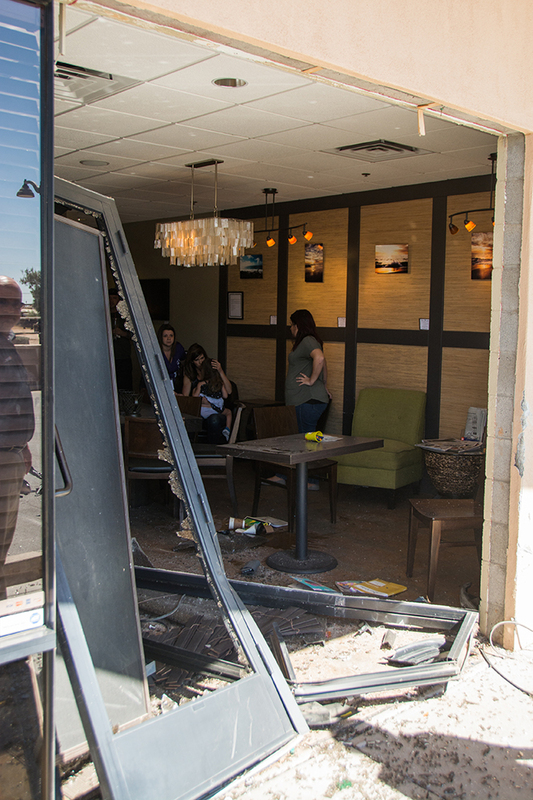 Customers Adam Hanson and Justin Lunsford were sitting at a table near the entrance when the front of the vehicle plowed through. 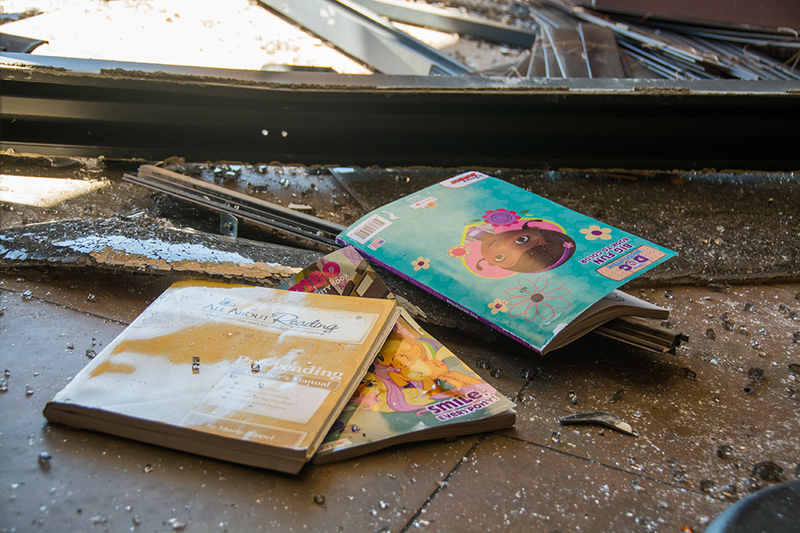 “We were sitting right there and we heard a screeching noise and all of a sudden everything moved this way,” Hanson said. 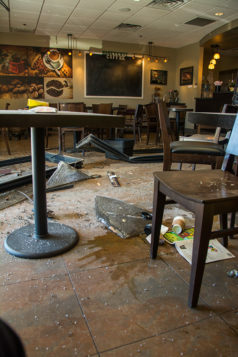 A mother and her young daughter were at a table closest to the front doors. 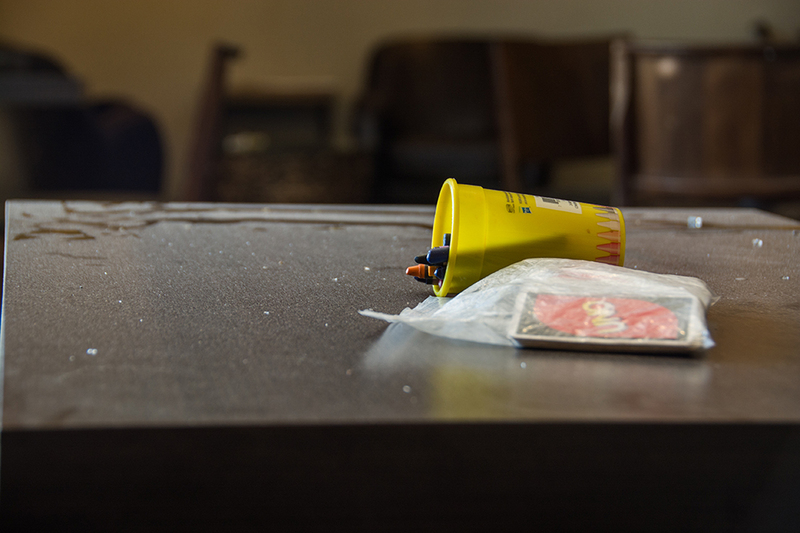 The mother said she and her child were thrown to the ground from the force. Maricopa Fire/Medical Department assessed injuries of the mother and daughter, but it is unclear at this time if they were also transported to the hospital. Alvarado confirmed at least two people inside the building have been transported for medical attention. MPD said an officer processing the scene found medication inside the vehicle, but it still unknown if the medication belonged to the driver, what effects the medication has on the body, and even if she consumed any prior to driving, Alvarado said. A serious injury, multiple-vehicle crash has blocked the northbound lanes of State Route 347, according to the Department of Public Safety. The accident is described as a rollover. The collision was about three miles north of Maricopa, just north of Casa Blanca Road. Drivers heading north are being directed onto Casa Blanca to Interstate 10. The southbound lanes are open, but traffic is moving slowly and backup is lengthy while first responders provide assistance on the scene. There is no estimated time to reopen the northbound lanes, according to the Arizona Department of Transportation. 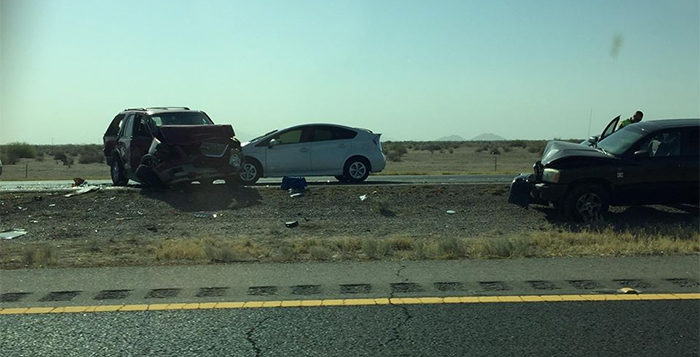 Blowing dust is being blamed for a series of accidents in the southbound lanes of State Route 347. There is a traffic back-up of about 2 miles from the Riggs Road interchange, according to the state’s Department of Transportation. Two crashes have been reported south of Riggs Road in the southbound lanes. 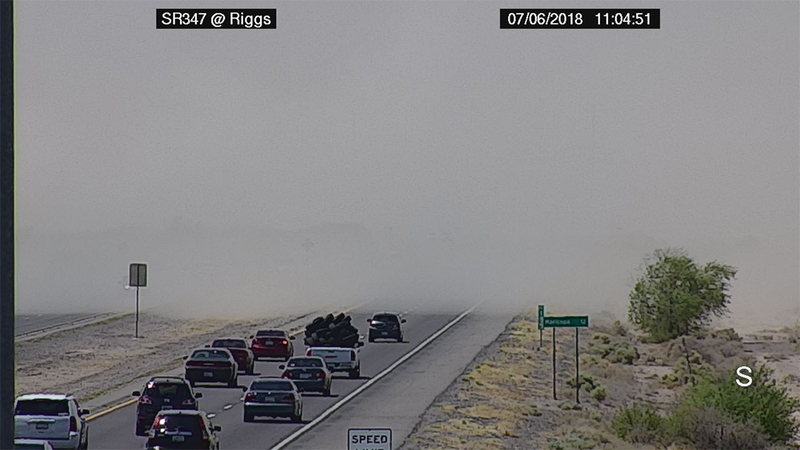 SR 347 is closed southbound at Riggs. Southbound traffic will be directed to Riggs Road and east to Interstate 10. The northbound lanes of SR 347 are closed at Casa Blanca Road. 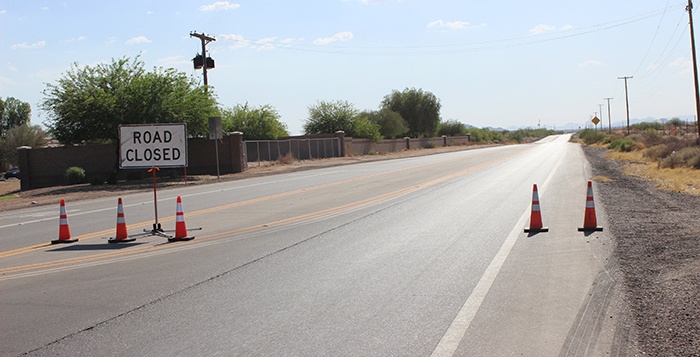 Drivers will be routed to eastbound Casa Blanca Road to return to I-10. Motorists should plan for heavy delays and try to avoid the area. There is no estimated time to reopen the highway. The National Weather Service has issued a blowing dust advisory in the area until 8 p.m. Expect gusts of 30-35 mph and visibility of less than a mile. This can lead to hazardous travel conditions. If you encounter blowing dust or blowing sand on the roadway or see it approaching, pull off the road as far as possible and put your vehicle in park, turn off the lights and keep your foot off the brake pedal. Traffic on State Route 347 was blocked Thursday morning by multi-vehicle collision. Seven vehicles were reportedly involved in the crash that occurred around 7:30 a.m. in the northbound lanes just south of Riggs Road. Traffic was backed up to the Gila River for about an hour until the left lane was cleared.